I sat under my tree today. The prickly Acacia tree blocked out the sun. Its sparse leaves and thorns sheltered me from the 100-degree sun. My childhood dogs, all now six feet under, kept me company. A curl of my overgrown pixie haircut caught a puff of the wind and dangled over my eyebrow. Hair seems to grow faster in the desert, perhaps it’s all the minerals in the water. After a long sigh at the thought of being “home”, I let my breath drift into the breeze that was tossing the sand around me into swirls. This is my desert. The rocks that surround me, the uncomfortable dry heat, the chain link fence and the alfalfa field that sprawls out towards Mexico are quick reminders that I am home. There is a new lump of dark, bubbly dirt that contrasts the smooth, light colored sand around it. That’s Elmo. Elmo, my little 16-year-old yorkie-poodle that I found in the middle of the street as a 12-year-old child on rollerblades. She came into our lives and made her lasting, 15-year impression. Elmo died last week, the last connection to my childhood dogs. I found her on a hot summer day. The small bundle of dreadlocks and mattes was shaking. In the middle of the high noon desert town, the city seemed to sleep and the asphalt was hot. I gathered her 10 lbs up, stood there in the road with the little bundle in my arms and looked around at the houses. Not a soul was in sight in the hot midday sun. With no other idea of what to do, I took her home. “Mom, I found …..” my voice trailed off. I said to her through the bathroom door, Mom was just getting out of the shower. She probably already knew what it would be, I was notorious for rescuing all the neighborhood dogs. The rest of the day was spent trying to get the curly black blob to stop shaking. We pulled apart parts of matted hair and trimmed the hair around her face until her kind little brown eyes poked through. I posted flyers and we called the Humane Society to see if anyone had called in looking for the shaggy little dog, secretly, greedily hoping they had not. She was clearly neglected, her little bones protruded underneath all that coat of black hair and her eyes and ears were sealing shut with un-groomed hair. She had sticks and leaves wrapped up in the tangles and the hair had grown over the pads of her feet, she wasn’t even walking on her paws anymore. We gave her a haircut, spending hours delicately cutting out the tangles and burrs into a puppy cut and I decided that her shaggy, black, floppy paws looked like the hands of Elmo from Sesame Street. The little back dog became Elmo, and she moved in to the house. She spent many life events with me growing up. She played Toto to my hand-sewn Dorothy Wizard of Oz Halloween costume that my Grandma made me. We won 1st prize for that one. She even accompanied me to show and tell as school. On the other side of the Acacia tree are also two bigger lumps. Their dirt is now sun bleached and flat from rains and weather and wind. 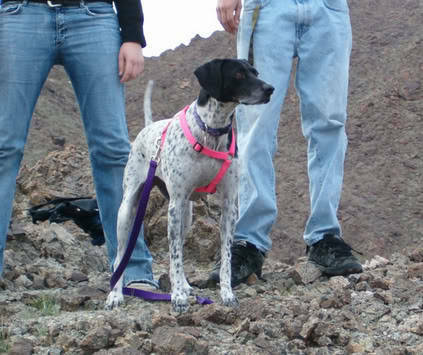 The actual first dog to be buried out in our desert home was Molly. Molly was my dog, and she died too young. She didn’t make it to 10, taken by the widespread dog cancer. The other dogs were family dogs, but Molly had chosen me. I think it was back in the 6thgrade, I was poking along the street that led right up to my house on 9thAvenue. That day I was dragging my feet, hopping and skipping along. I had my thumbs shoved into my backpack straps and was enjoying the oncoming storm. Rainstorms don’t happen often in the desert, I was excited for the thunder and desert smell of rain, secretly hoping to be caught in it on the way home. I’ve always loved the rain, like a sweet perfume that can’t be bottled and I only get to smell on rare, special occurrences. A crack of thunder gurgled across the sky and a flash of black and white spots came lurching at me full speed like a racehorse out of the gate, bounding over the sidewalk towards me. What’s a 6th grader to do? I had no idea if it was aggressive. The wind was blowing and the sky was dark. I had found many stray dogs in my little border-town neighborhood. Dogs were often loose or un-licensed. I even had regulars, I knew where many of the local dogs lived, and their owners probably expected me to bring them back. But this sleek and slender bundle of spots was stretched out like a greyhound, heading towards me. As she neared, I stood my ground and waited. There wasn’t a person in sight in the neighborhood, perhaps all inside preparing for the rain. As the dog neared and slowed, her whole body turned into a pulsation of wiggles and excitement and her tail flew like a whip in a circular motion. She acted as if I was the first person she’d seen on this planet in days. Looking around, as with Elmo’s story, I was the only person outside, along blocks and blocks of desert homes at 2:40 PM in an oncoming thunderstorm. No one had seen this miraculous burst of excitement as the dog ran up to me and wrap her arms around me in a bonefied dog hug. She had no tags, just a blue collar. As a purebred English Pointer, I assumed she belonged to someone who had paid good money for her. Knowing I couldn’t get attached to this one, I let her follow me home out of the storm. It hadn’t yet started to rain. 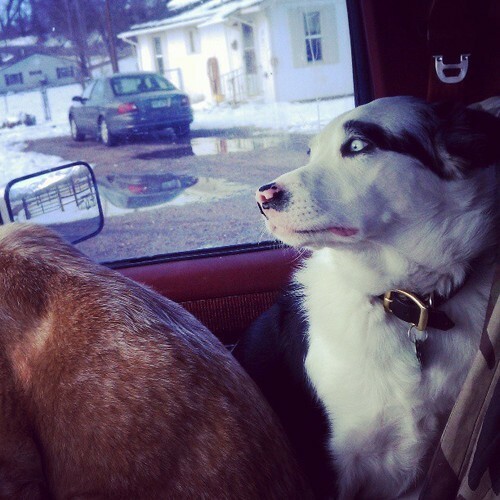 My mom sighed at the arrival of yet another dog. My mom called the Humane Society and did our usual routine. We left our phone number for any potential owner to contact us if they called the Humane Society looking for an English Pointer. We kept her overnight, through the thunderstorm. Of course, I couldn’t help but fall in love with the bundle of energy. I also knew that I could appease her energy! I was 12, and had rollerblades and was outside all day. As soon as I got out of school the next afternoon I bounded home down the same street, I couldn’t wait to get back to play with the spotted dog. Not long after I arrived though, my Mom explained to me that the Humane Society had called back with a number of a young couple calling to describe their lost English Pointer, “Molly”. It was definitely her they’d described. I snapped on a leash and slowly walked her to a little house up the street. The last thing I’d expected was this cute, young little family. They’d just had a baby. They seemed overwhelmed at the bouncing dog on the end of my leash. Never in my 12 years did I expect the young husband’s to ask what he did. “We’ve been having a lot of issues with her energy level, she jumps the fence constantly, we can’t keep her in and we don’t have the time to exercise her and now with the new baby…” he seemed relieved at my enthusiasm. “I’ll go ask my mom!” I exclaimed. I bounded back down the street with Molly in tow. She liked this new game, she could run all day. She was definitely a dog that needed a kid. I couldn’t tell you what made my mom say “okay” that day. But she did. Molly became my dog. She was mine ever since the day she chose me and leapt in to my arms. There was no doubt that she picked me that day, an apparent last plea before the family took her to the Humane Society. I taught Molly how to wear a harness and rollerblade with me to horse commands for speed changes. I taught her that clucking meant to run, and smooching sounds meant to trot. She learned left and right commands, she’d stop on a dime when I sad “whoa” and “easy” and her and I went far and long and for many of my school years. As soon as my backpack hit the ground after school, I’d suit Molly up in her pink harness and we’d go out, her slender figure stretched in the sun, running full speed for hours of the afternoon. She stayed with us until the day she died of cancer the week before my 22ndbirthday. She had held out for my visit home from college that year, to see me one last time and to say goodbye, dying not long after I left. Beside Molly’s dirt is Max. He has the biggest lump of dirt, he was a big dog. We decided the big yellow Labrador mix was mixed with some sort of large, goofy breed like a Mastiff or a Great Dane. His legs were certainly much longer than a lab’s and his tail was slender, and longer. I couldn’t tell you where I was going or what I was doing the day I came across him, but after leaving my house I saw a man down the street mowing his lawn with a long legged lab-looking-puppy trailing along behind him in his front yard, prancing his front feet up in the air as he went. He was trying to grab on the man’s pants, or shoes, or perhaps the lawnmower itself. I had to stop and giggle at the sight. It was an image straight off of the Coppertone sunscreen ad. The puppy couldn’t quite reach the man’s backside, but he was trying. I took a few steps more, the man realized I was watching the funny scene and laughed too. I assumed he’d just gotten a new puppy. I assure you I knew every dog that lived on my street and this puppy was a new addition. I kept walking and laughing to myself and before I knew it the little yellow puppy was bouncing and bobbing along beside me! I stopped to look back at the man with the lawnmower who was still smiling, waving and nodding, apparently content that the silly puppy had found its owner. It was now quite happily attached to my heel. I walked back to the man’s yard, “isn’t this your puppy?”I asked. “No!” he said, “I thought it was yours!” I turned around and walked back home with the puppy. I put him in the backyard of our house, he took two steps beside the swimming pool, curiosity got the better of him and he fell in. We fished him out, he learned his lesson. My mom called the Humane Society, I made a flyer to post all over the neighborhood and we tried to find the owner of the puppy whose ears and paws and legs were too big for his little body. He had a white snout and a small spot of white on his head, his legs looked like he’d been dipped in a white paint bucket up to his knees, not leaving out a tip of his oversized tail. He just seemed happy to be in the world, as any lab puppy with a kid, and a yard, and specifically a swimming pool might. We never received a call about the lost puppy. Ater warming the hearts of both my mom and my stepdad, Max stayed. Max was short for Maxtor, a manufacturer of computer hard disk drives, and fitting, because my stepdad owned a computer company. When we took him for walks he would flip his big paws out in front of him with his nose in the air, tail up high and slightly arched over to the side from the length and weight of it, and strut. Max and Molly were in love until the day they died and Elmo seemed to consider the both of them the silly kids in the house. Max grew into his big white paws one day though, a shiny golden lion of a dog. He guarded our backyard from his home-made desert dog house until his last days. 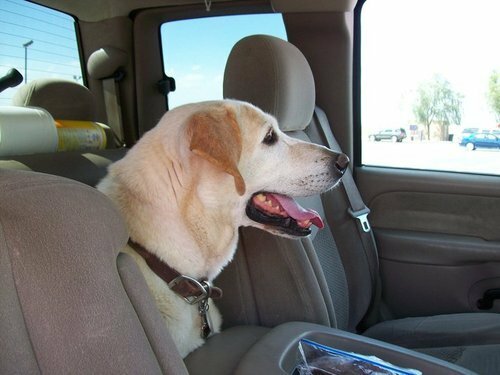 He died of old age, his hips, as in most yellow labs, eventually weakened and the rest of his body suffered because of it. He died peacefully and after years of being without his Molly, they are now buried side by side. As I sat under this tree of mine, I noticed just how prickly it was! The spikes on its solemn branches poked out further than the leaves. It had grown large; Mom and I planted it ourselves from just a tiny twig of a thing when we moved out of town. 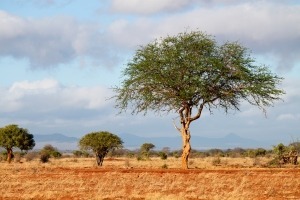 Being a hot weather tree with roots in Africa and Australia, it thrives in the desert. It both guards and shades the dogs of my childhood. Hank came and sat by me under the shade of the tree. He had explored the area, and was apparently satisfied with his findings in the sand, and tired of the heat. Hank had picked me out too, as his previous owner brought him over to meet me, and in the busy petstore where I worked, he came and sat at my heal. “Do you want to go stay with her?” The girl asked him. He didn’t budge from my heel. 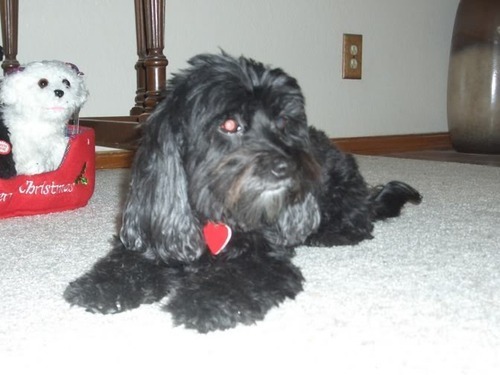 It had been years since Molly’s death, since I’d had space in my heart for another dog. There was a void in me, a lonely spot, and Hank came along at the the right time. He’s also black and white and spotted all over, and I’d needed him. His wise eyes surveyed the landscape around him. He’s a calm, but eager dog who wasn’t born in the desert. He’s a snow dog, from Colorado so the heat is new to him. We sat and enjoyed the shade under the lone little Acacia tree. Thank you so much Brenna! Dogs really are such a powerful part of our lives.